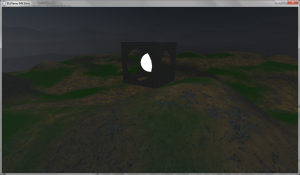 The terrain and the hollow cube are triangle meshes, and the white sphere is raytraced. I want to explain how I set up the rendering pipeline. First of all you’ll notice that I’m using a multisampling texture to read back the depth values from the previous mesh rendering pass. Then you’ll see that I’m using the SV_SAMPLEINDEX semantic, which is needed for sampling that texture. This way I ensure a perfect sample match between the depth texture reads and raytracing output writes. After reading the depth value from the texture, I do a simple comparison between it and the distance between the raytraced geometry and the camera in world space. If that test passes, I render the sphere, otherwise I return an alpha value of 0. Alpha blending does the rest. The result is a nice integration between raytracing and mesh-based rendering using multisampling.